We travel to the gorgeous city of Holland, Michigan on the shore of Lake Macatawa for the largest tulip festival in the US. 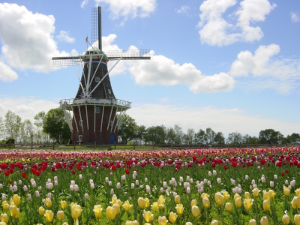 During May's Tulip Time Festival, we will recall Holland's Dutch roots, and see tulips blooming all over the city. This escorted tour includes motorcoach travel, luggage handling and 3 nights accommodations. • Lots and Lots of Tulips!